Do you have any prized old tools, either still in use or kept/displayed just because they're rare, particularly well made or hold a nostalgic interest etc? I hope to add a section to the main site sometime with a few of my own favourites, I just wonder what everyone else here has stashed away? Pre-war steering puller set, lovely item to sit on show and has been used a surprising amount of times! A pair of HM dockyard pliers, given to me in 1964 in Portsmouth. Still the best ones I've got, and in the drawer ready for use. And an original complete Jaguar Mk 1 tool box too. My most used, get me out of trouble tool, is a pair of bumper ringing irons. Two large F shaped bits of kit that are great for tweaking bits of awkward tin. They are pre-war from when my Old Man served his time on Daimler, Minerva, and Rolls Royce. apart from dozens of old spanners and sockets that I can't seem to throw away I still have a pair of old tyre levers. though I can hardly recall having used them in last 40 years! I will, perhaps cut the grooved pole down a bit...but until then, I'll leave it as it is, just in case I have to track up a lorry or something? Actually used it to do tracking on my old Cannon [which has a Ford Model Y front axle]...although the gauge is a bit bent, it still works...Useful for tacking up the sundry old Ford stuff I have....and does no harm sat in the corner of my shedshop. Needs a large tarmac area to use...do you think Tesco would mind if I taped off one corner of their car park?? A WWII American wrecking or crow bar. Bought by my Dad after the war from Newbury Racecourse dispersal sale when he was equipping himself for his new carpentry apprenticeship. Most of his old American tools were sadly stolen from his workshop in the 1970's but I still have a few of them, one being the bar. It is a small one so very useful for various jobs on the car as well as the carpentry. It did come in very handy recently for assisting the removal of a stubborn cylinder head. Oddly enough our local history group recently found and rescued a WWII US Army Glider delivery crate that had been used as a tailors workshop after the war. When we stripped out the postwar linings to the walls there were white painted shadow stencils of carpenters tools all over the walls where it had been used as a carpenters shop on Greenham Common - and my wrecking bar fits one of them perfectly ! 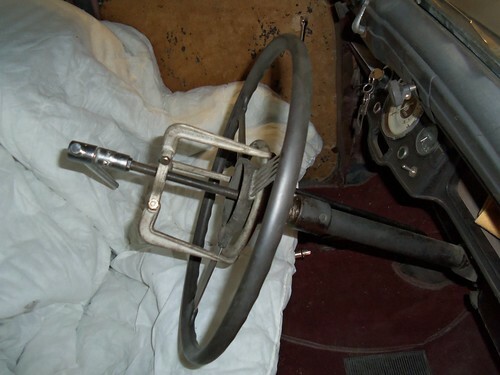 A picture of the previously mentioned steering wheel puller, it is being used on my 47 Minx. It has 3 sizes of ring collar for larger sized steering wheels.